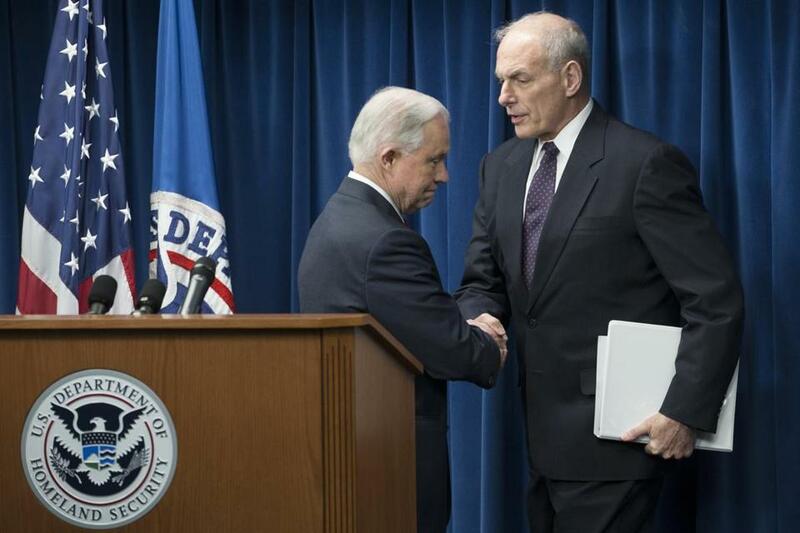 Attorney General Jeff Sessions (left) shook hands with Secretary of Homeland Security John Kelly. Immigrant doctors from the six Muslim-majority countries included in President Trump’s revised travel ban play a critical role in caring for Americans, especially in many of the Rust Belt and rural areas that voted heavily for the Republican, according to an analysis by graduate students in economics at Harvard University and MIT. The economists found that these doctors, who handle about 14 million patient visits a year, are unevenly distributed across the country, often settling in areas where American doctors are reluctant to work. The researchers — who are pursuing doctorates in economics or have recently earned that degree — found the US physician workforce includes more than 7,000 doctors who attended medical school in Iran, Libya, Somalia, Sudan, Syria, and Yemen. Those are the six countries whose citizens are banned from entering the United States unless they already have a visa or green card, under Trump’s new order. But the travel ban will not immediately affect doctors already working here. “There’s a lot of benefit that comes with having people like doctors immigrate to the US. These doctors are not concentrated in rich parts of the country,” said Mitra Akhtari, one of the project’s leaders, who is pursuing a PhD at Harvard. One-quarter of America’s physicians are foreign-born. Immigrant doctors are often the mainstays of medical care in rural areas, with hospitals providing incentives, such as sponsoring visas or helping the doctors get status as permanent residents. The young economists’ analysis, released to coincide with the president’s order, found a high concentration of doctors from the banned countries working in the Rust Belt and Appalachia. Those physicians handle 1.2 million patient visits per year in Michigan; 880,000 in Ohio; 700,000 in Pennsylvania; and 210,000 in West Virginia. The five American cities with the highest share of doctors from targeted countries are Toledo and Dayton, Ohio; Detroit; Los Angeles; and Cleveland. The five specialties with the highest percentages of doctors from the six countries are cardiology, pathology, neurology, gastroenterology, and internal medicine. The researchers estimated that just over 150 doctors from the banned countries work in Greater Boston. Eastern Massachusetts has a relatively low concentration of such doctors. A recent study in the journal BMJ suggests foreign-born doctors may provide better care than their American counterparts. The study found that older Medicare patients were less likely to die when cared for by foreign-trained internists. But the travel ban has put teaching hospitals under pressure to reject medical students from the six nations when selecting residents for post-graduate training, for fear that Trump’s immigration policies will bar the residents from entering the country. Even as revised Monday, the travel ban will disrupt medical education, according to the American College of Physicians, which represents internists. Fourth-year medical students will learn March 17 which residency program has accepted them and will need to start July 1. Dr. Nitin S. Damle, president of the internists’ group, said the 90-day ban will not leave enough time for students to obtain visas. “Each medical resident treats thousands of patients over the course of a year,” Damle said, calling for an exception for medical residents. The economists drew their data from Doximity, an online network with information about virtually every practicing physician in the United States. The students culled the physicians who earned medical degrees in the six countries and looked up the ZIP codes for their workplaces. The researchers limited their count to the 827,522 for whom they could obtain both medical school information and ZIP code.